The USS Hawaii under construction in Groton, Conn. It will be the second Navy warship to be named after Hawaii and is expected to be in service by March with some Navy officials and Hawaii politicians saying it could be stationed at Pearl Harbor. Gov. Linda Lingle, the ship's sponsor, and U.S. Sen. Daniel Inouye will represent Hawaii at the blessing. Retired Hawaii Army National Guard Master Sgt. Raymond Ganotise will give the blessing. Also in the audience will be Adm. Gary Roughead, Pacific Fleet commander. "The naming of the USS Hawaii recognizes this rich legacy of Hawaii," said Inouye, the keynote speaker for Saturday's ceremonies. "Since World War II, Hawaii, on a per capita basis, has had a significant portion of its men and women wear the uniform of the United States." Lingle and Rear Adm. John Donnelly, deputy commander of the Pacific Fleet, have said the nuclear-powered sub, with the capability to operate in shallow waters, could be berthed here. Lingle made the statement after she flew in August to a Rhode Island shipyard to participate in a keel-laying ceremony for the third ship in the Virginia class. She also carved her initials on a metal plate that will be part of the 377-foot submarine. The Pentagon's latest war plans unveiled earlier this year revealed the possibility that Pearl Harbor's fleet of 17 submarines could grow to 18. Three other Pacific Fleet nuclear subs are based in Guam. Inouye has said he has been told that Guam's contingent will grow to four. But Lt. John Gay, a Navy spokesman at the Pentagon, said yesterday that neither a home port nor a commissioning date or place have been chosen for the Hawaii. Gay said it will undergo a shakedown cruise before the Navy assumes control of the sub a year from now. The construction of the Hawaii is a partnership between General Dynamics Electric Boat and Northrop Grumman Newport News. The USS Hawaii is designed to be a cheaper alternative to the Seawolf class and can work both in the deep ocean and in shallow waters as a special weapons platform. At 377 feet it is 17 feet longer than Los Angeles-class submarines. At 7,800 tons the Hawaii also is lighter than a 8,100-ton Seawolf-class submarine. Six Virginia-class submarines are contemplated, but so far only one, the USS Virginia, is in service, with the USS Texas expected to join the fleet next month. Improvements to the Hawaii include sensors mounted on its bow, hull and sail, as well as towed sensors, which will allow it to detect large objects such as quiet diesel-electric submarines, and smaller objects, including mines. The Hawaii will not have a traditional periscope. Two photonic masts mounted on the exterior will provide digital images, including color and infrared, directly onto screens in the command station. There are now three types of nuclear-powered attack submarines in the Navy: the Los Angeles, Seawolf and Virginia classes. There also are 18 Ohio-class Trident nuclear ballistic missile boats. Currently, the Navy's attack sub force of 53 is split almost evenly, with 28 boats prowling the waters of the Atlantic and 25 in the Pacific. 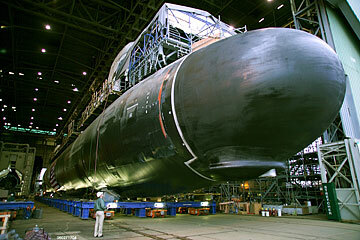 By 2010 there will be 31 nuclear-powered attack subs in the Pacific Fleet and 21 assigned to the Atlantic Fleet. The first USS Hawaii, the third Alaska-class cruiser, similar to a battle cruiser, was launched Nov. 3, 1945, but never commissioned. Reduction in defense expenditures after World War II suspended construction of the Hawaii in September 1947, and in 1959 the Hawaii was sold for scrap. There have been submarines named after Honolulu and King Kamehameha.